ARKS premier grade’s Dane Jobe on the break. ARKS lined up against Wests Scarborough for round 2 of the RugbyWA senior competition. In the premier grade, the ARKS players were joined by their allocated Western Force players, with Harrison Orr at number eight and Elliot Turner the half-back. However number 10 Mish Buick was missing, a key to the ARKS backline. The game turned out to be a great one to watch as both sides attacked at every opportunity, but ARKS went down 32-27. Wests scored first with a try and a penalty but then ARKS finally got into gear and a good set of phases saw Regan King put Adam Sutherland over in the left corner. The next score was from some powerful forward play which then freed Kitione Fuluna to touch down next to the posts after 25 minutes. The Wests reply was quick, catching the ARKS caught napping to score beneath the posts, sending the score to 12-17 at half-time. The second half saw Wests score first with a converted try, but ARKS were able to come back with a try of their own. Ten minutes later Wests scored a unconverted to go further ahead and finally they were awarded a penalty from the tackle release to make the scores 17-32. ARKS were not finished and went in again, scoring a converted try and then gaining a penalty in the last four minutes to close the gap. Although pressing hard at the final whistle, there was not enough time to get the final score they needed for the win, going down 27-32. There were far more players who turned up for reserves this week than last, but unfortunately there was not much training time so the team was a bit unsettled. The first quarter was relatively even with both teams matched in the scrums and at the break-down. Wests scored first until ARKS managed to score on the half hour to remain in the game, but Wests scored again to lead 23-5 at halftime. The second half showed the lack of fitness among the newly returned players. With players tiring, Wests dominated the loose ball and ARKS were again subject to penalties at the tackle and break-down. Wests ran out comfortable 47-8 winners. After last week’s game the thirds were quietly confident of having a good competitive game, but it was Wests who drew the first blood with a penalty after just seven minutes. The teams swapped penalties for the first 25 minutes until the half-hour when captain Blair Gibbons scored a try. ARKS went to halftime leading 11-6. 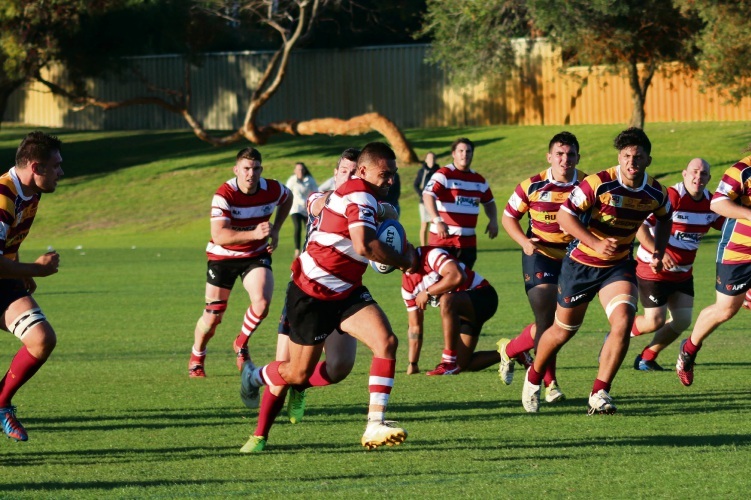 The second half saw ARKS again take the attack to Wests, but a yellow card awarded for a perceived deliberate knock-on when an ARKS player tackled an opposition ball carrier saw the penalty swing the balance of the game in Wests favour. The ARKS boys struggled to get back into the game, although coming close to scoring several times. Penalties given away by ARKS at the break-down saw attacking moves turned over every time. The final score saw Wests win 27-11.